The Villa is ideally located on the highest point of the Caldera offering absolutely breathtaking panoramic views of the Aegean Sea and the magnificent Santorini sunset experience. The tranquil scenery from the Villa is calming and peaceful, captivating you with the empowering energy of the island that will invigorate and recharge and at the same time offering an “at home”, the welcome atmosphere during your stay. Erossea Villa sanctuary is ideal for those who are looking for comfort, class, tranquillity and privacy, highly recommended for honeymooners, families, romantic couple escapes and friends seeking a quiet comfortable indoor and outdoor setting. 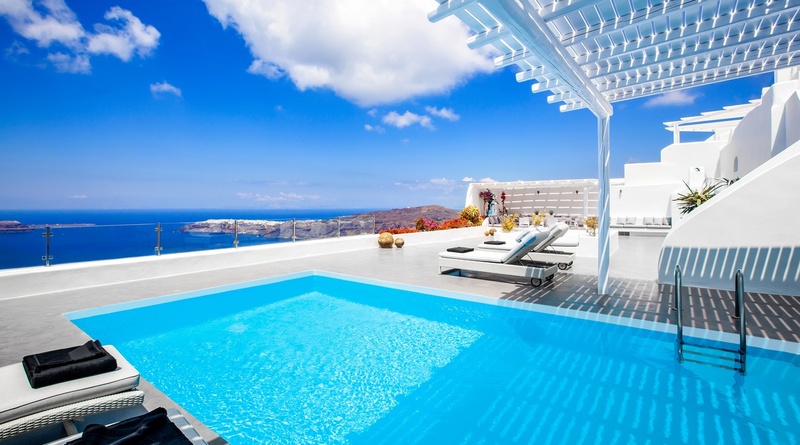 It is the epitome of a private vacation in Santorini. Erossea Villa is a luxurious, newly renovated “cave” Villa consisting of two connecting levels with comfortable living areas suitable for up to 10 guests. It offers 132m2 indoor and 180m2 outdoor spaces. • VILLA LEVEL is suitable for up to 4 guests + ‘1’ extra (65m2 indoor and 180m2 outdoor space). It features a spacious living room with dining area for 6 guests, an open plan kitchenette and two Master Bedrooms with En-Suite Bathrooms with shower. • SUITES LEVEL with 3 Suites suitable for up to 6 persons (67m2 indoor space). It features a small living room with a dining table for 4 guests, a well-equipped kitchen, three Master Suites each with an En-Suite Bathroom with shower. • The TERRACE is 180m2 and offers a heated pool partly shaded with Pergola, a sun terrace equipped with sunbeds, an outdoor Jacuzzi, a Pergola shaded sitting and dining area, lounge areas, small garden and a view of incredible, majestic sunsets, the Caldera and the Aegean Sea. Private heated pool, outdoor Jacuzzi, Auto power generator: Air condition, flat screen Satellite TV in each room, Audio stereo system, wireless internet connection, landline phone, first aid kit, iron and ironing board, individual safe in each room, Nespresso coffee machine, ice maker, hair dryer, and books. - Luxury transportation options ranging from cruising to neighbouring islands on private yachts, speed boats and helicopters, to luxury cars and other vehicles.